This week I was inspired by the chord changes of Miles Davis’ modal jazz masterpiece Flamenco Sketches. I used the chords as the basis to improvise using three basses, fretless electric, acoustic upright (double bass) and acoustic bass guitar. This is the second video I’ve made playing jazz with these three basses. If you’d like to find out more about why I’m using them, then check out my previous video called Playing Jazz with Three Different Basses. Once again, I’ve featured a composition by the great jazz trumpeter and band leader Miles Davis. My previous video featured a composition called Solar. It wasn’t a conscious decision to feature the same composer twice. However, it does reflect the influence that Miles Davis’ music has had on me and my own jazz education. The two compositions, Solar and Flamenco Sketches, actually have very little in common. Other than that they’re written by the same composer. Solar is what jazz musicians would refer to as a Bop tune. And Flamenco Sketches is an example of Modal Jazz. They represent very different stages of Miles Davis’ career even though they were only written about five years apart. Also, in this video, I’m only using the chord progression for Flamenco Sketches as a basis for improvisation. Whereas, I played the melody of Solar as well as an improvised solo, which is more or less consistent with the Bop style. The album Kind of Blue, is one of the most famous jazz albums of all time. It was released in 1959 and it marked a complete change of direction in modern jazz. It’s debatable whether or not Miles Davis actually came up with the idea of Modal Jazz. Because there are earlier compositions by other composers, that could be described as modal jazz even though the term wasn’t used to describe them at the time. But Kind of Blue undoubtedly established modal jazz as a major movement in modern music, and it marked a sea-change in jazz. The concept of modal jazz is actually very simple. In order to understand it, you must first understand Bop, which had been the prevailing style in modern jazz up until the late 1950’s. Modern jazz really started with a style of music called Bebop, and particularly two gentlemen, Charlie Parker and Dizzy Gillespie. Check out my video about playing Charlie Parker Bebop melodies on fretless bass here. Miles Davis began his career as a teenager, playing with Charlie Parker and Dizzy Gillespie in the late 1940’s and early 1950’s. So his background was in Bebop and he continued playing a style of Bop called Hard Bop throughout the 1950’s when he lead his own band. The composition Solar first featured on a Miles Davis album in 1954, and it is typical of a Bop style jazz melody. The style of Bebop was all about complex melodies and fast moving chord progressions. In order to play it you needed both technical skill, to keep up with the pace, and also exceptional understanding of harmony and ability to navigate fast moving chord and key changes. The Hard Bop movement was a bit less high paced and a bit more soulful, but it still relied upon the melodic and harmonic style of it’s predecessor Bebop. Modal jazz, by contrast, doesn’t rely on chord progressions. Where Bop compositions tend to change chords in virtually every bar. Modal compositions tend to stay on just one chord for extended periods. The improvisers role in modal jazz is not to navigate continually shifting harmony as in Bebop. It’s to create melody from modes. Modes are essentially scales. Each chord implies an accompanying scale which the improviser can use to create a tune. Flamenco Sketches is a classic example of a modal jazz composition, it is essentially just five chords, or five modes. Very simple in theory, but it’s also one of my favourite jazz compositions. Flamenco Sketches starts in C major, I would use a C lydian mode to improvise on this first section. Find my video about Lydian Sounds here. The second chord is Ab7sus4. The sus4 chord voicing is intentionally ambiguous, because it doesn’t define the chord as being either major or minor. Therefore there are a number of different ways you can approach it. Miles Davis uses a major triad starting on the fourth Db, which I’ve tried to emulate in my improvisation. The third chord is a Bb major chord, and again you can use a lydian mode here. This precedes one of my favourite moments in any jazz composition. Which is a change from the Bb major to a D phrygian dominant mode. This has to be one of my favourite chord changes. I remember seeing Ron Carter’s band play this piece in London in about 2003. It was such a beautiful concert. One moment from the concert that I can still remember all these years later was when the band changed to the D chord in Flamenco Sketches. Ron Carter had an extended range on his fourth string so he could reach a low D on his bass. I’ve tuned the fourth string on my upright bass down to a D in the video to emulate this. It’s the phrygian dominant mode that gives the piece it’s Spanish flavour. You can find my video about the phrygian dominant mode here. The Spanish sound is integral to the composition. For this reason, this section of the song lasts twice as long as the other four modes. The final chord is a Gm7 chord, you can play a dorian mode here. The original idea for this video came because I was practicing a technique for artificial harmonics which I’ve adapted from the guitar. I’ve never done artificial harmonics like this on bass before. I use a different technique usually. I haven’t done a video about artificial harmonics yet, but I will do one soon. So stay tuned to my Bass Practice Diary if you want to learn this technique. I was using this technique on a guitar and I started wondering if I could use it to play chords on my acoustic bass guitar. 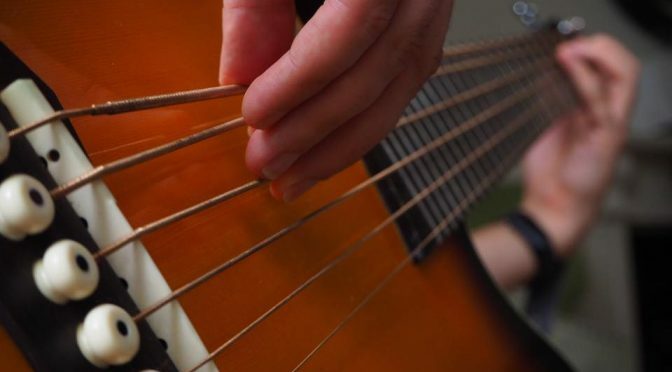 Once I found it worked I immediately had the idea of playing the chord changes for Flamenco Sketches using the technique. I recorded it and added the improvisation on double bass and fretless bass, and that’s the video!